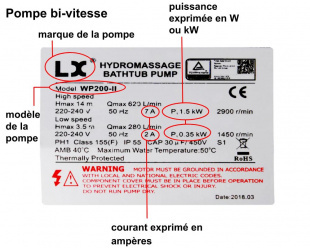 If you want to replace your pump, referring to the brand of your spa will not give you the necessary information. Your spa may have been designed with different brands of spare parts over the years, and its manufacturer may choose to install a Waterway circulation pump one year and an Aqua-Flo pump the next. Note that "pump" manufacturers mainly produce its hydraulic part - the pump body - and buy the motor elsewhere (e. g. Waterway pumps are most often equipped with an Italian E.M.G. motor). 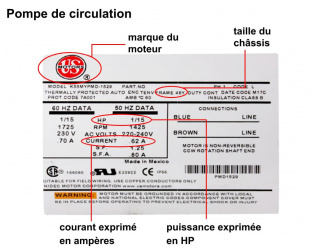 This means that you can find both labels or plates from the motor manufacturer and labels from the pump manufacturer. 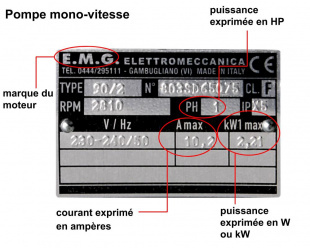 The dimensions of the pump and/or the wet end to be changed are obviously important, but the informations on the label on the motor (or more rarely the wet end) are even more essential: they give you the brand of the pump or its motor, the series, the type (single or two-speed), the power, etc. These informations can sometimes be difficult to understand, so we have listed, according to the type and brand of the most common pumps on the market (see pictures opposite), the important elements to know in order to find the equivalent (or similar) pump on our website. 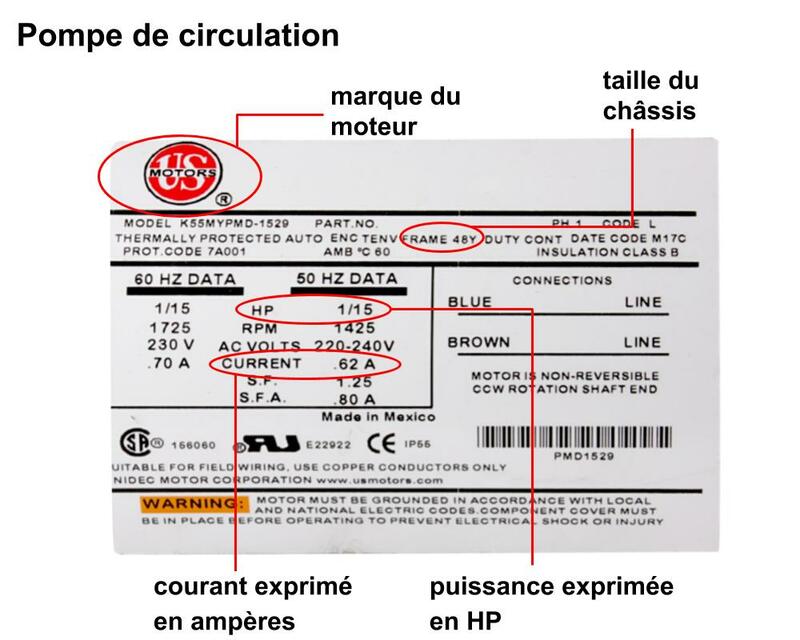 Whether it is the brand of the pump (Waterway, Aqua-Flo, Whirlpool LX, Espa...), or the motor (E.M.G, US Motors), this information is clearly noted on the label or plate. XP3, WP 250-II, Executive, Niagara... This is the name given by the manufacturer to a certain range of pumps. The name of the series is not enough to find the equivalent pump (the Executive and Niagara pumps for example exist in single and two-speed versions, and in different motor powers), but it is a good start. The power is noted in W or kW, and/or HP (for Horse Power). If 1 HP = 0.75 kW conversion is still often used, we strongly recommend that you rely on the power indicated in W or kW rather than that in HP. The latter measure is not necessarily reliable, since it is not standardized. If you do not have a power expressed in W, you can calculate it from the current indication, expressed in amperes. Remember the formula P = U x I, and multiply the current in Amperes by 230 to get an approximate indication of the pump power in Watts. A single power indication, in W or kW, obviously refers to a single-speed pump. Two power indications refer to a two-speed pump, the low speed giving the circulation power, and the high speed giving the massage power. You will also know that you have a two-speed pump if it is powered by a four-wire cable instead of three, because there is one phase wire for each speed of the motor. Small variations around these values are not important. Your old pump could indicate a speed of 2900 rpm, but that doesn't prevent you from replacing it with a 2800 rpm pump. This data is very useful, when it appears, if you want to change the pump casing or part of it. The pumps are mostly made of 48-Frame or 56-Frame. All the pumps offered on tubs.fr are adapted to the electricity of the European sector, i. e. for a voltage of 220-240V, 50 Hz. If you have a pump that is powered at 60 Hz or with a different voltage (110V or 400V, for example), contact us for details. A protection index, noted on all pump labels with the acronym "IP", characterizes the tightness level of the pump; there is the IP acronym associated with two numbers (example: IP67) to indicate the degree of tightness against solid substances, such as dust (first number) and liquids (second number). 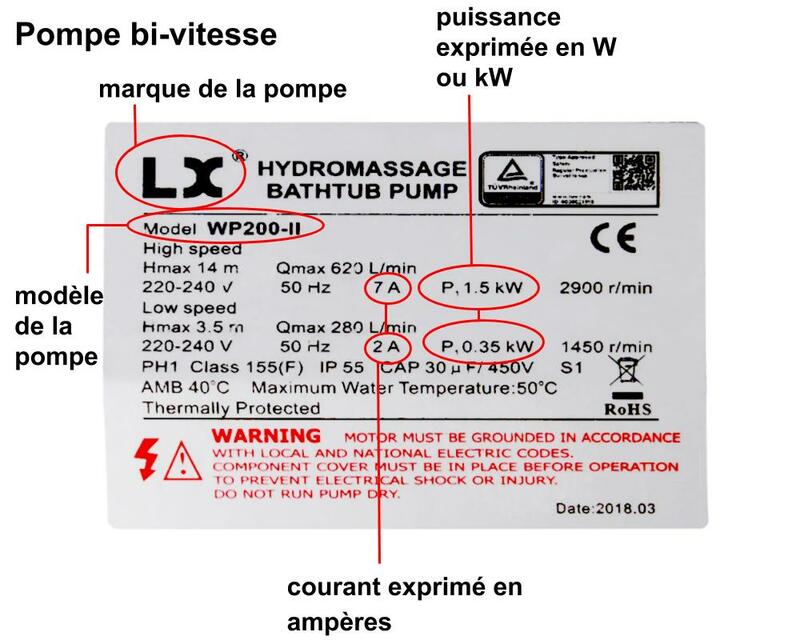 An IPX5 protection rating (photo 1) means that the operation of the pump does not imply the need to protect it against the intrusion of solids, and that it is protected against water jets with a hose. An IP55 protection rating (photos 2 and 3) means that the pump is protected against dust deposits, and that it is protected against water jets with a hose. The "Qmax" note written on some pumps corresponds to the maximum water flow rate, in m³/hour, litres/minute or gallons/minute (GPM), which can be supplied by the pump with a minimum of resistance. Note that 1 US gallon = 3.8 litres. 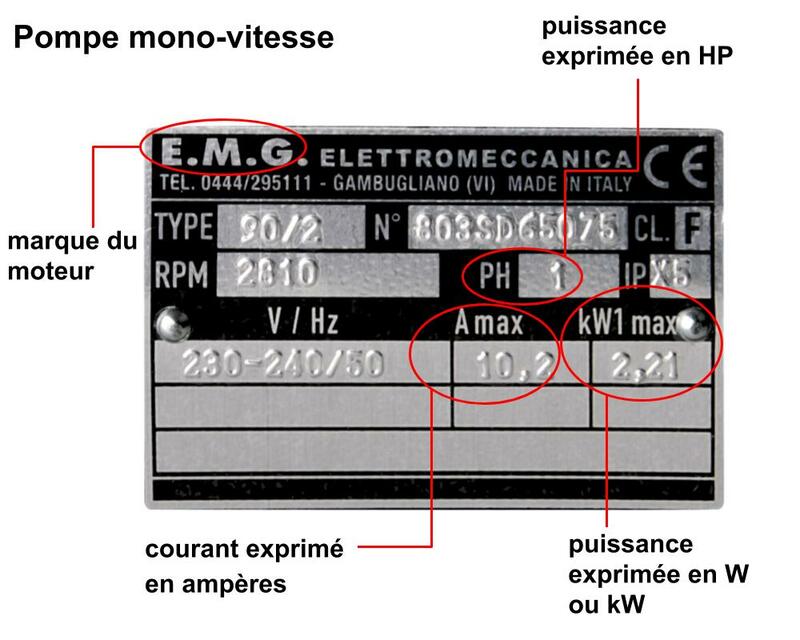 Some labels indicate "Hmax", followed by a value in metres or feet (1 foot = 0.3 metres). This value represents the maximum resistance of the circuit for which the pump was designed. The higher this value, the more the pump will be able to force water over long distances and through small pipes and sprinklers, and the more it will be able to raise the water above the pump level (hence the Hmax value expressed in meters). Each length of pipe, elbow, filter, heater and jet increases the resistance of the circuit, and will reduce the flow rate.